Design Goal: Create a unique and memorable enemy that is difficult enough to create a lasting challenge while having a simple attack pattern that can be countered. Description: Since one of my strengths is pure mathematics, I decided on a bat that would have no collision with the environment, allowing its behavior to be entirely controlled by discrete mathematical functions. I created two phases for it: Circling and Charging. The circling phase involves the bat flying around the player including major and minor circular motion. The charging phase involves the bat accelerating linearly towards the player. With the charging phase completed, the more difficult circling phase was next. I wanted to ensure that as a level designer, I would have a lot of flexibility in quantitatively balancing the bats motion to feel just right. Thus, I made sure that my script would have multiple variables exposed; more than I ended up actually tweaking. Because of how mathematically intense this script is, I decided to craft it completely at an abstract level before even attempting code implementation. 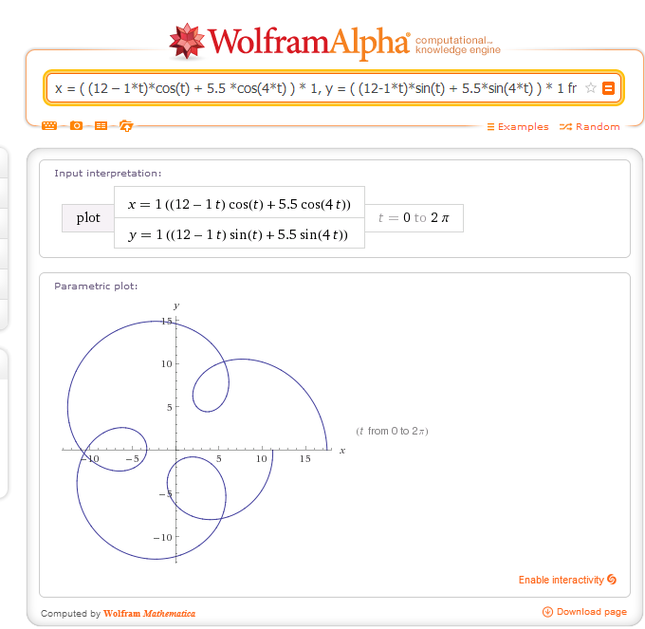 To ensure that my math was working, I used WolframAlpha to visualize my equations before moving forward with the A.I. Visualization of one possible outcome of the final bat equation. This represents the in-game flight pattern of the bat, assuming the player is standing still at the origin. Design Challenge: To get a smooth looking flight pattern, I had to refresh myself on how to mathematically model circular motion and I had to integrate the velocity function x'(t) to get the position function x(t). Additionally, taking the pure math into code is not without its own difficulties and required being cognizant of the effects of converting continuous math (Calculus) into discrete math (dt updating).